The system status page lets you get a general overview of the detailed information on various ongoing activities, and the resources being used in the survey system. Running surveys: The number of surveys currently running. A running survey is defined as having start date prior to the current date, and stop date preceding the current date. Online/ongoing respondents: number of respondents that are online and answering survey questions for all surveys in total. These respondents have not completed the survey. 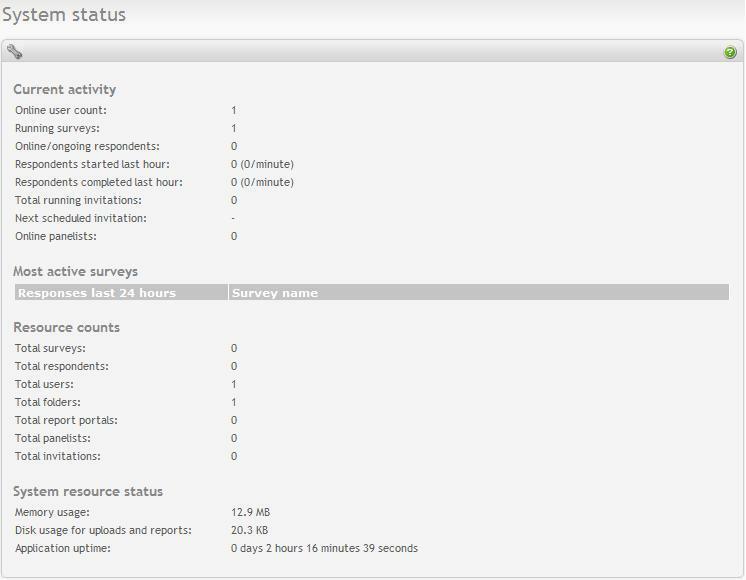 If a respondent has left the survey without completing, he is removed from this count after 20 minutes of inactivity. Respondents started last hour: number of respondents that has begun answering survey questions during the last hour for all surveys in total. This includes those who have finished the surveys. The average number of respondents per minute started within last hour is listed in the parenthesis. Respondents completed last hour: number of respondents that has finished answering survey questions during the last hour for all surveys in total. The average number of respondents per minute finished within last hour is listed in the parenthesis. Total running invitations: number of invitation tasks whose status is 'PENDING' or 'RUNNING' for all surveys in total. Next scheduled invitation: next scheduled invitation task whose status is currently 'PENDING'. Online panelists: number of panelists who have started responding to surveys but not yet finished for all panels in total. Most active surveys lists up to 10 surveys that have the most number of responses within the last 24 hours. Surveys are listed from the most active to least active. The table lists the survey names and their corresponding responses. Total surveys: total number of surveys in the system. Total respondents: total number of respondents for all surveys. Total users: total number of users (authors). Total folders: total number of folders. Total report portals: total number of report portals. Total panelists: total number of panelists for all panels. Total invitations: total number of invitations for all surveys. Application uptime: the time elapset since the application was started. Time is measured in days, hours, minutes and seconds.